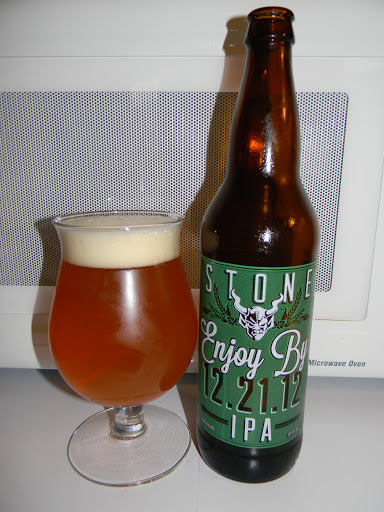 Review of Stone Enjoy By 12.21.12 IPA | Beer Apprentice - Craft Beer News, Reviews, Interviews and Info. Hello again guys. For today’s craft beer review I’m going to be trying the Enjoy By 12.21.12 IPA produced by the Stone Brewing Company located in Escondido, California. This will be the first of the “Enjoy By” IPA’s that I’ve had the opportunity to try and my time is beginning to run out, so I better get to it. The website, stonebrew.com, had this description about this version of the fairly popular beer. You have in your hands a devastatingly fresh double IPA. While freshness is a key component of many beers – especially big, citrusy, floral IPAs – we’ve taken it further, a lot further, in this IPA. You see, we specifically brewed it NOT to last. We’ve not only gone to extensive lengths to ensure that you’re getting this beer in your hands within an extraordinarily short window, we made sure that the Enjoy By date isn’t randomly etched in tiny text somewhere on the label, to be overlooked by all but the most attentive of retailers and consumers. Instead, we’ve sent a clear message with the name of the beer itself that there is no better time than right now to enjoy this IPA. The brew came in a 22 oz. bottle and it had an ABV of 9.4%. It poured semi-hazy with a vibrant orange color. The crown was barley off white and sized nicely. The texture was soft and relatively fluffy. The retention time was solid and the lacing was quite alright. The nose was very juicy and fresh. Tropical fruits of orange, pineapple, peach and grapefruit. It had a sweet malt and light floral component mixed with a very slight resinous aspect to create an, obviously, hoppy profile. I didn’t discover any alcohol, which was fine by me because it let me concentrate on those lovely hops. The flavor was similar to the aroma. Fresh, juicy tropical fruits with a light crisp breadiness. Again, the malt and dank resin were very sweet and enjoyable. The alcohol was barely noticeable. One thing is for sure, this brew was not all that balanced. It was all about the hops. The mouthfeel was medium bodied. It was lightly crisp, but with a smoothness that couldn’t be denied. It was very refreshing, dry and thirst quenching. The carbonation was spot on and it had just a smidgen of warmth. An excellent dose of flavor was left behind after each swallow too. Overall, I thought this was an excellent, albeit a straight forward beer. Stone is not trying to hide the fact that this is a “hop head’s” beer. If you like the hops, you’ll really enjoy this brew. I know I did. The drinkability was outstanding. I finished this bottle in no time flat. I hope this is a series that they continue to make from time to time. I could easily see myself picking this up on a regular basis. It could also be enjoyed at any point during the year as well. It would be great for the freshness of Spring. So, if you guys have a bottle of the Stone Brewing Company’s Enjoy By 12.21.12 IPA….. you don’t have much time left!!! Get it in a glass and enjoy. Burger, fish 'n chips or drink alone? Suggestions? It goes well by itself, but I would actually probably pair it with a light salad actually. I'm not one to try to pair food and beer too much. I want the full flavor of the beer to stand out. Now, if I can find the beer, a salad it is! Obviously, it's best to drink the beer by the “Enjoy By” date, however I'm thinking that this may be a regular offering by the brewery. So, definitely keep your eyes peeled for the next version and be sure to let me know what you think if you get the opportunity to try one.